Piece’sTrajectory:AnticAjuntament (Tarragona, 2005), Museu de les Terres de l'Ebre (Amposta, 2005), Fundació Niebla (Girona, 2005), Sala d'Art Jove (Barcelona, 2005), Museu de la Universitatd'Alacant (2005), M. ZilinskoDailesGalerija (Kaunas, Lituania, 2006). 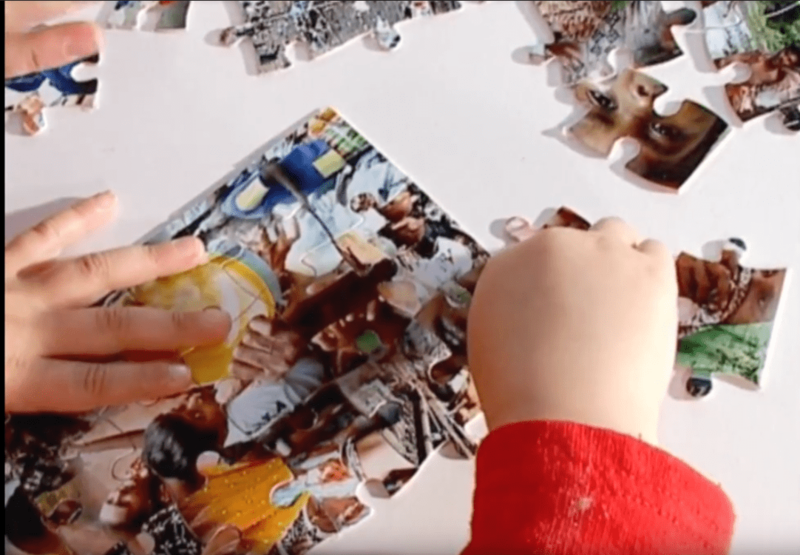 For forty-two minutes, the hands of a mother and child play with the pieces of a puzzle. A puzzle is a game that usually consists of reconstructing the image of a paradisiacal place, of a tourist destination. In this case, the mother and son face an impossible reconstruction: the images represented correspond to places in Southeast Asia the days immediately following the devastating passage of the tsunami. Museums, art festivals and other international events frequently contribute to transforming a city into a destination. Through this process of transformation, objects, buildings, even customs, become a cultural heritage. This tendency displaces the experience towards a docile territory free of controversy. The result is a product around which the tourism and entertainment industry is deployed (hotels, airlines, travel agencies…), and in which the meaning is built where the viewer can only look and get excited but never respond critically.